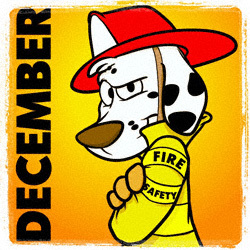 Of all the months of the year, the one with the most residential fires is December. With all of the holidays occurring including Hanukkah, Christmas, Kwanzaa and New Year’s Eve, there is plenty of celebrating going on from extra cooking and baking to lights and candles. 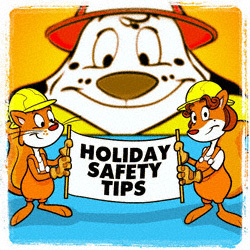 Cooking fires account for over 50% of the December fires, while children playing with fire (candles, etc) make up over 25%. There are relatively few fires from decorations thanks to the strict standards of UL certified lights and the trend towards artificial trees which are usually sprayed with a fire retardant, but Christmas tree fires tend to be some of the worst for overall damage. Real trees are particularly risky when partnered with overloaded or damaged wires from lights, or being too close to a sparking fireplace or lit candles. Most kitchen fires are caused by inattention, likely because of distractions going on in another room. Invite your guests to come and help you in the kitchen with your preparations so you can visit while getting the holiday meal ready. 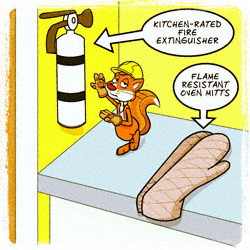 Keep a kitchen-rated fire extinguisher easily accessible, but not too close to the stove. Use flame resistant oven mitts. Wear tighter fitting clothes with short or tight sleeves in the kitchen. If you are wearing a loose shirt, tie it back by putting on an apron. If your clothing does catch fire, smother it with a towel, or drop immediately to the floor and smother the fire with your body. Keep towels hung up instead of on the counter where they could be pushed on to a hot burner. 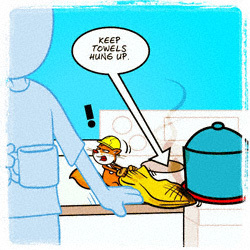 Don’t use towels to move hot pots or pans from the oven or stove as it’s too easy for an end to drag on the burner. Use the microwave whenever possible to heat something that needs constant stirring. If you have to leave the kitchen, turn off the burner or broiler and turn it back on when you come back. If your oil starts to smoke, it is too hot and can catch fire. Put hot grease in a can and let it cool, never pour directly into the garbage. 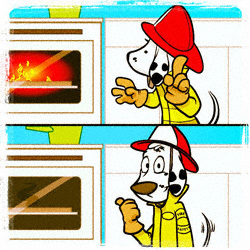 If you have a fire in your oven or microwave turn it off but do not open the door. It will use up the oxygen and put itself out. 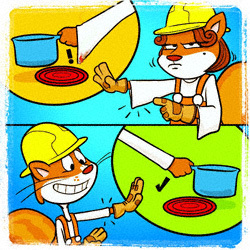 If a pot catches fire on the stove, smother it with a pot lid or use your fire extinquisher. Other ways put out a fire is to smother it with baking soda or a large wet towel. 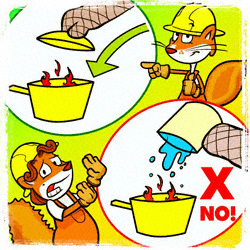 DO NOT CARRY A BURNING POT TO THE SINK OR POUR WATER ON THE FIRE! If you cannot immediately put out the fire yourself, get everyone out of the house and call 911. Never leave candles burning unattended. Pets or children can easily knock them over. Do not burn candles or smoke anywhere that you might fall asleep. 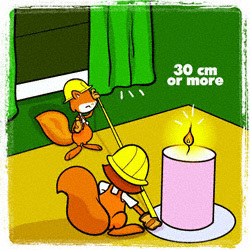 Keep all burning candles at least 30cm away from anything that could catch fire. Use candle holders with wide and low sturdy bases that are more difficult to tip. 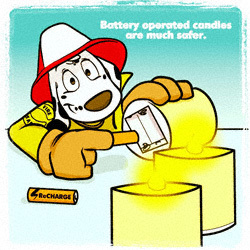 Consider battery operated candles which are a much safer alternative. Use a screen on your fireplace at all times and never allow a child to poke at or put more wood on the fire. Do not burn boxes, gift wrap, or any kind of packing materials in your fireplace. 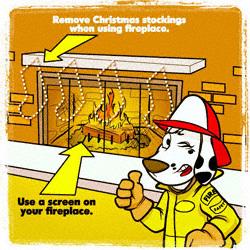 Remove Christmas stockings from the mantel when using the fireplace. If you are using a real tree in the house, choose a freshly cut tree with needles that do not fall off when you touch them. It should have a strong smell and very green colour. 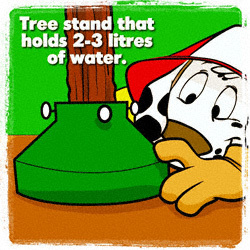 Use a tree stand that holds 2 - 3 litres of water and top it up every day. 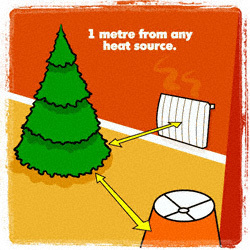 Make sure that that your tree is positioned at least a metre from any heat source including vents, TV, fireplace or lamps. Inspect your light strings and replace any with broken or frayed wires, broken or loose bulbs or ones that do not have a UL certified label. Do not connect more strings together than what the manufacturer specifies. Avoid metal decorations which could shock you if they make contact with faulty wires. Do not coil up an extension cord that is in use, or run under the rug to help prevent overheating. Make sure your cord is positioned where it cannot be damaged by furniture or people walking over it. 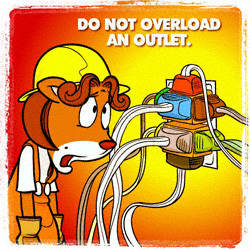 Make sure your plugs are inserted fully into the outlets and do not overload an outlet. Always turn off your lights before leaving the house or going to bed. Dispose of your real tree when it starts to drop its needles. A live tree will only last 10-14 days after it is cut. 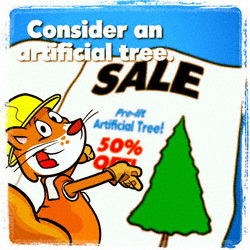 Consider investing in an artificial tree. Artificial trees are treated to be fire resistant, but do not use metal trees which can become energized by a faulty set of lights. 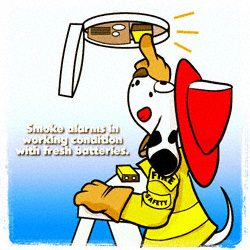 Make sure all of your smoke alarms are in working condition with fresh batteries.